Don’t serve it cold. Because refrigeration stiffens cheeses and dulls their flavors, give soft cheeses 20 minutes before serving, and let firmer cheeses have at least 40. Don’t wrap it in plastic. Like many fermented foods, cheese needs oxygen. Plastic wrap suffocates it, ruining the flavor, trapping moisture, and encouraging mold growth. Store cheese instead in cheese paper or wrapped tightly in wax paper and held in a loose plastic bag. Don’t overstock. A cheese’s flavor fades quickly once it’s cut from the wheel, so buy only as much as you’ll eat within a few days. Grate it yourself. Because pre-shredded cheese contains preservatives and declumping agents that ruin texture and flavor. Shouldn’t the place you lie down each night be a work of art? Savoir Beds’ National Gallery Collection combines bespoke furniture craftsmanship with the customer’s choice of any of 2,300 paintings held by the National Gallery of London. Savoir beds have long been known for their five-figure price tags and “extraordinary” contents—“think cashmere from the necks of Mongolian goats.” You can select everything that goes into your mattress as well as the artwork for the upholstered headboard and frame. 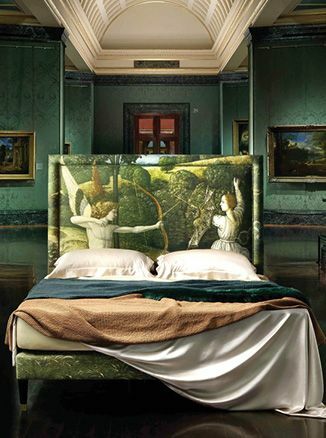 The bed shown here features Gherardo di Giovanni del Fora’s The Combat of Love and Chastity.